Comrades-in-arms bury Indiana volunteers who fell in battle atop Rich Mountain. This summer I’ll travel into the Alleghenies near Beverly, West Virginia, in Randolph County, to visit the site of the Battle of Rich Mountain. Here in a mountain pass in 1861 George B. McClellan secured his reputation as a winning general and was afterward appointed commander of the Army of the Potomac. The battle was brief, lasting only two hours. 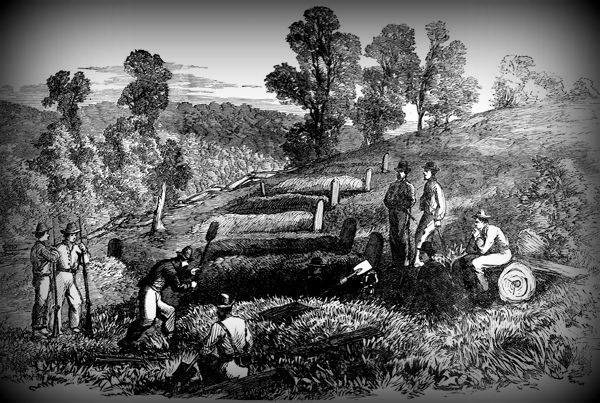 That morning, on July 11, Brigadier General William S. Rosecrans, under McClellan’s command, led 2,000 men through a drenching rain to attack a log-and-dirt fort raised by rebels above the pass. There Confederate Lt. Col. John Pegram had set a force of 310 men and a single cannon, which held off the Union force into the evening. Badly outnumbered, however, they retreated under the cover of darkness. You can find out more about the battle here. Coincidentally, Rosencrans and the Union troops were led to the summit by a young man, 22-year-old David Hart, whose father owned the farm adjacent to the fort — a farm that figures in a ghost story published in the Wheeling Register on February 15, 1885, by Lewis Kittle, who lived on the Indian Fork of Clover Run in Tucker County. “In 1867 Kittle and his companions were mining coal near the Rich Mountain battleground. He and a cousin, Daniel Courtright, boarded in the house of a Mr. Hart, who lived adjacent the battlefield and whose home had been used as a hospital when the conflict occurred. The first night that they stayed in the room they heard a strange, continuous noise, which they assumed was the wind, but a few days later they were told it was a ghost. “On a Saturday night some time later Kittle was sleeping alone in the room when he was awakened by a chill and saw a “clammy, cold light” outlining the objects in the room. He then saw eight forms clad in Confederate uniform. Four of them went to the bed where he had been sleeping and removed the covers. They then stepped over and raised up an invisible object, which they laid carefully upon apparently nothing between the other four, who stood in a position which indicated they were pall bearers. 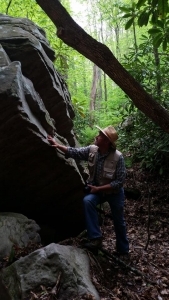 W.Va. Explorer editor David Sibray climbs a forest cliff. “As they passed out of the door, Kittle saw they were carrying the body of a handsome young man. When they reached the hallway a noise “resembling the knock of a crutch on a wooden floor” was heard, followed by the closing of a door. Previous articleDid Poe write “The Raven” while visiting Saint Albans, W.Va.?